Gorilla Tape has taken duct tape to a new level. This double thick adhesive tape surpasses ordinary duct tapes, making the list of uses virtually endless. Made with double thick adhesive, strong reinforced backing, and a tough all-weather shell, it s the biggest, strongest, toughest thing ever to happen to duct tape. Gorilla Tape is manufactured with a highly concentrated rubber based adhesive two to three times as thick as traditional duct tape. The result is a tape that fills gaps and penetrates rough surfaces. It sticks to rough and uneven surfaces, including wood, stone, stucco and brick, that ordinary duct tapes can't hold. To us, it s made the way tape should be: The Toughest on Planet Earth. Directions: Use like any other tape. 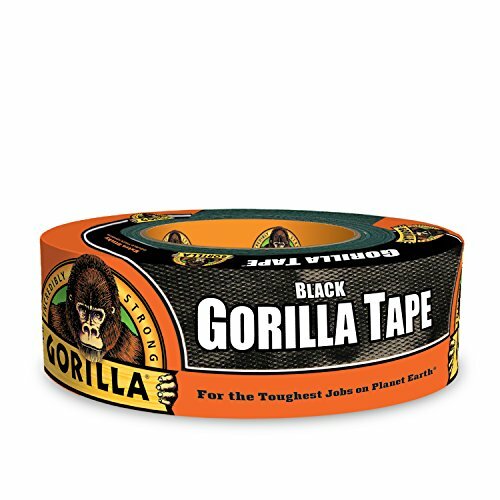 Tear Gorilla Tape by hand or cut to size with a knife or scissors. It is important to clean the surface and brush off any loose particles and dirt before applying Gorilla Tape. Apply the tape carefully, smoothing out any pockets or rolls. That s it. Enjoy the strength and durability of Gorilla Tape! To retain adhesive quality, store Gorilla Tape in a cool, dry place. Keep out of direct sunlight. Try storing the tape vertically (rather than laying flat), on a hook or on wax paper. If you have multiple rolls, keep your excess supply wrapped until they re needed. Gorilla Tape works best at temperatures above 32 F (0 C). For best results, always apply the tape at room temperature. If Gorilla Tape freezes, it will work just fine once it returns to room temperature. Gorilla Tape can be removed, but with some difficulty and it may leave some residue. To remove any excess residue, we recommend using the tape itself as a blotter. Gorilla Tape should not be used as an electrical tape. We ve found that Gorilla Tape will last a lot longer than regular duct tapes when it comes in contact with moisture. Click on the Gorilla link at the top of this page to see other quality products from the Gorilla Glue Company. EZ Start Tape is designed for use with any 3" core tape dispenser or gun. 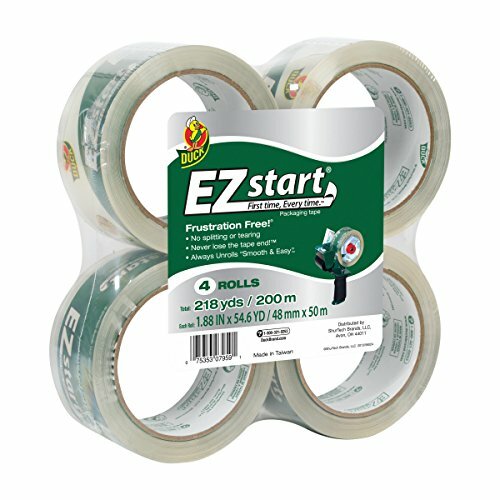 Sealing tape features unique EZ Start to eliminate any difficulty in starting roll. Tape unrolls smoothly, quietly and easily the first time and every time. No more splitting or tearing. Packaging tape meets U.S. Postal regulations and offers a 2.6 mil thickness. 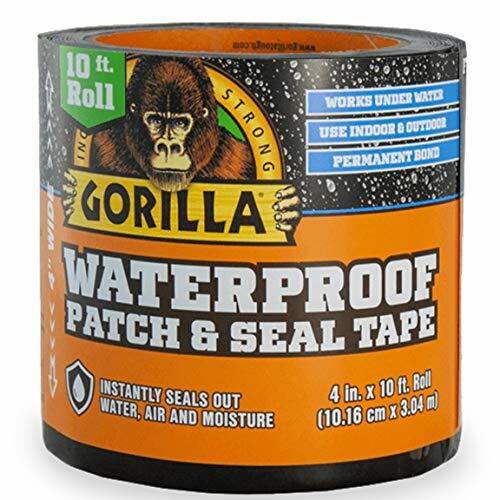 Gorilla Waterproof Patch & Seal Tape instantly seals out water, air and moisture. With an extra thick adhesive layer and UV resistant backing, this flexible tape conforms to form a permanent bond indoors and out. At 4 inches wide use it to patch holes, cracks, gaps and tears, even underwater. Excellent for Home, auto, marine, camping, RVs, outdoors and more. Will work on plastic, metal, aluminum, rubber, wood, vinyl, glass, steel, acrylic and much more. Gorilla Waterproof Patch & Seal Tape can be applied in hot, cold, wet and dry conditions. For best results, apply the tape to a clean surface at room temperature: 1. Keeping liner on tape, cut tape to desired size. Tape size should be larger than the repair area, extending beyond all edges. 2. Remove the release liner and place tape over desired repair area. Tape cannot be repositioned once applied. 3. Rub entire surface of the tape aggressively, especially the edges. STORAGE: Store tape on the top and bottom disc at room temperature. Edges of tape may be sticky. SERVICE TEMP: -70 F to 200 F. Performance will be dependent on surfaces & conditions. Surfaces must be clean, smooth and non-porous. Water must be pressed out from underneath tape. Not for use on seams, applications under pressure, or automotive applications under the hood. May not adhere to silicone or water-repellent materials. Do not use to hang. Permanent: may damage surface or paint if removed. Click on the Gorilla Link at the top of this page to visit the Gorilla Brand Store. 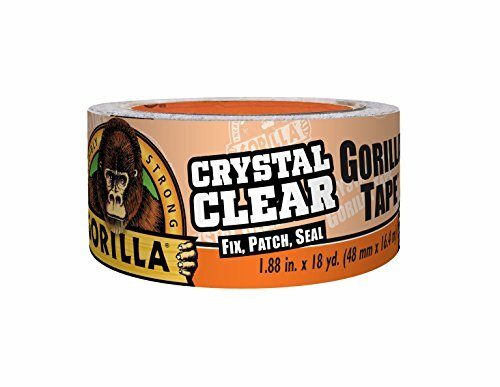 Crystal Clear Transparent Gorilla Duct Tape features the strength of Gorilla Tape, in a crystal clear tape that does not yellow outdoors. Made with a heavy duty adhesive layer and waterproof backing for extreme durability. This tape is UV and temperature resistant - great for projects and repairs both indoors and out. 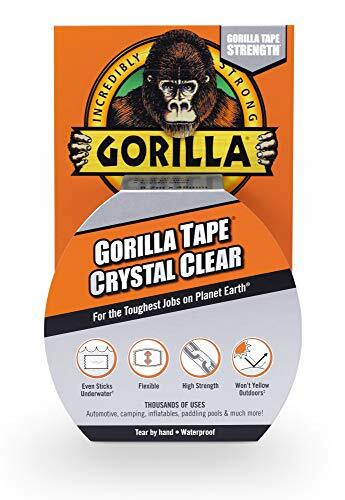 Crystal Clear Gorilla Duct Tape is best if used between 10 F and 120 F. To prevent fingerprints, clean your hands prior to using the tape and handle the tape only at edge. Use a straight edge (credit card or similar object), to press out fingerprints.For best results, apply the tape to a clean surface. Airtight patches are best achieved on smooth, dry surfaces with the tape on both sides of the repair (when accessible). Tape size should be larger than the repair area, extending beyond all edges. Rub the entire surface of the tape aggressively, especially the edges. NOTE: Surface patch will gain additional strength with time. Crystal Clear Gorilla Duct Tape works best for patching with a single layer. Not for patching inflatables at seams. Click on the Gorilla link at the top of this page to see other quality products from the Gorilla Glue Company. Gorilla All Weather Waterproof Tape is an ideal solution for outdoor repairs. Made with incredibly strong, permanent, butyl adhesive and a weather resistant shell, this tape withstands even extreme weather conditions. 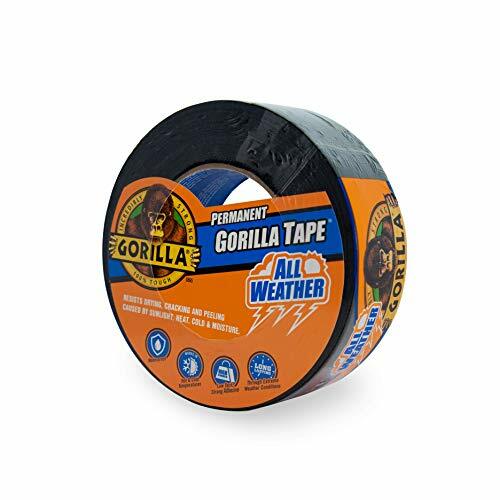 Gorilla All Weather Tape resists drying, cracking, and peeling caused by sunlight, heat, cold, and moisture and works in both hot & cold temperatures. Use like any other tape. 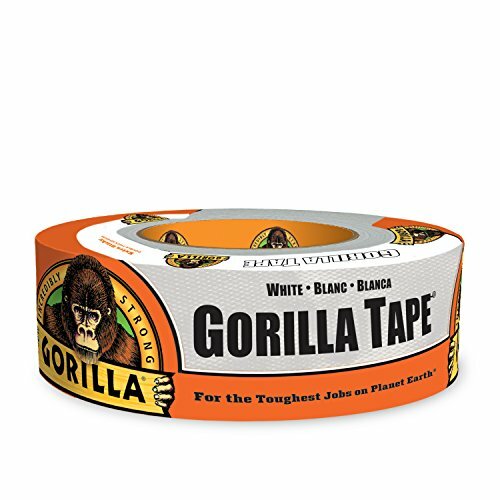 Tear Gorilla Tape by hand or cut to size with a knife or scissors. Apply the tape carefully, smoothing out any pockets or rolls. That s it. Enjoy the strength and durability of Gorilla Tape! For best results, apply to a clean surface free of dust, dirt, and debris. Great for tarps, plastic sheeting, roofs, vents, RV's, and all general purpose heavy duty repairs. Gorilla All Weather Tape contains a highly concentrated rubber based adhesive and sticks to most plastics, including polyethylene (PE) and polypropylene (PP). Gorilla All Weather Tape does not work on materials with high oil or plasticizer content, such as EPDM rubber or PVC. An acrylic tape, such as Crystal Clear Gorilla Tape, may be better suited for these materials. Gorilla All Weather Tape should NOT be used as an electrical tape. Store tape flat on a non-delicate surface. Click on the Gorilla link at the top of this page to visit the Gorilla brand store. White Gorilla Tape offers over-the-top results with its triple-layer strength and outstanding versatility. This double thick adhesive tape surpasses ordinary duct tapes, making the list of uses virtually endless. 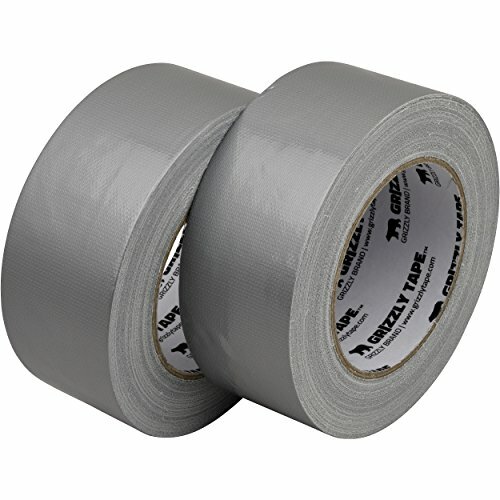 Made with double thick adhesive, strong reinforced backing, and a tough all-weather shell- White Gorilla Tape is the perfect duct tape for both indoor and outdoor use. It sticks to rough and uneven surfaces, including wood, stone, stucco and brick, that ordinary duct tapes can't hold. To us, it s made the way tape should be: The Toughest on Planet Earth. Directions: Use like any other tape. 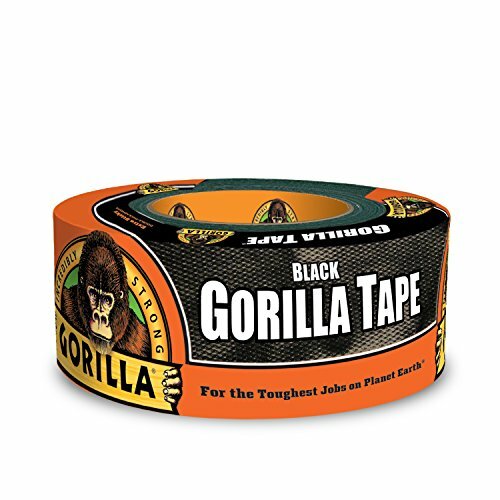 Tear Gorilla Tape by hand or cut to size with a knife or scissors. It is important to clean the surface and brush off any loose particles and dirt before applying Gorilla Tape. Apply the tape carefully, smoothing out any pockets or rolls. That s it. Enjoy the strength and durability of Gorilla Tape! To retain adhesive quality, store Gorilla Tape in a cool, dry place. Keep out of direct sunlight. Try storing the tape vertically (rather than laying flat), on a hook or on wax paper. If you have multiple rolls, keep your excess supply wrapped until they re needed. Gorilla Tape works best at temperatures above 32 F (0 C). For best results, always apply the tape at room temperature. If Gorilla Tape freezes, it will work just fine once it returns to room temperature. Gorilla Tape can be removed, but with some difficulty and it may leave some residue. To remove any excess residue, we recommend using the tape itself as a blotter. Gorilla Tape should not be used as an electrical tape. We ve found that Gorilla Tape will last a lot longer than regular duct tapes when it comes in contact with moisture. Click on the Gorilla link at the top of this page to see other quality products from the Gorilla Glue Company. We are a NEW company, so we are trying to offer you the best duct tape quality and value on the market in order to prove ourselves to you, the customer. Note that this is not duck brand, rather a cost-effective alternative of extremely high quality. 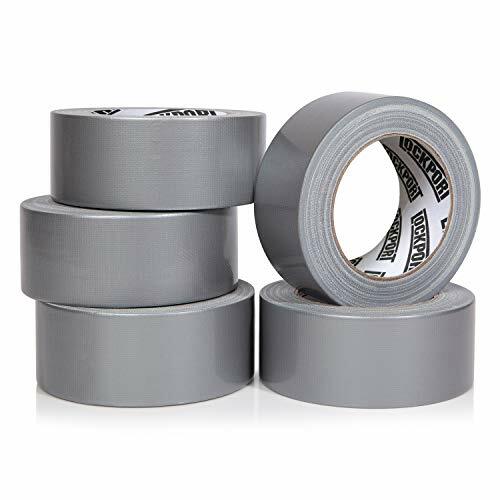 This tear by hand original gray duct tape comes in a bulk value pack that you can use to refill your collection of duct tape rolls. The 2 inch extra strength tape is non residue and works well for an industrial engineer looking for a strong adhesive and wide, flat waterproof roll that facilitates super tough leather repair and difficult outdoor weather. Use for insulation, large packing boxes, etc. You never know when you are going to need some additional yards of duct tape. Compare our quality to 3M and Nashua and you will see that we have maximized your value as a customer. Future Items: 60 3 4 10 12 18 1.88 20 30 35 50 6 100 45. STRONG original silver duct tape 5 ROLL MULTI-PACK. We offer bulk case savings and value in every pack you buy. 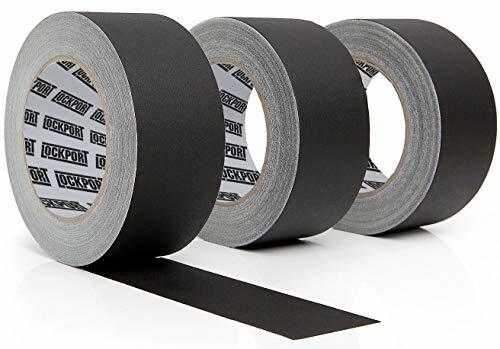 Now you can afford to use a whole lot of heavy duty duct tape for packing boxes, leather repair, insulation, warts removal or whatever your industrial engineer or average person needs may be. Keep some refills rolls handy! Each 2 INCH wide grey tape roll is TEAR BY HAND, strong, waterproof, no residue and okay for outdoor use. The adhesive is EXTRA STRENGTH for all normal purposes. You get GREAT SAVINGS per yard with this 30 YARDS and multi pack offering. Note, this is not Duck, Nashua, or 3M tape but rather a cost effective alternative when compared on a yrds and inches basis. 100% SATISFACTION GUARANTEE. Also, this tape is good for kids crafts or aspiring kid engineers. You can be 5 55 2 60 3 4 10 12 18 1.88 20 30 35 50 6 100 or 45 years old! Completing your DIY, repair or construction project to a high standard is only possible if you use the best tools and supplies for the job. Our silver duct tape rolls are made from strong, natural and real rubber adhesives as this gives a great bonding performance. Compatible with most surfaces it can be used to secure items in place in temperatures up to 200 degrees Fahrenheit. Although it has a strong adhesive strength it is surprisingly easy to tear. It is safe for anyone to use and is ideal for arts and crafts and decorating projects. The fact that our tape is not thin like others on the market ensures you achieve a secure and strong adhesive bond. There's not much that our strong duct tape can't do. Apart from fixing ducts, it can be used for general maintenance around the home, bundling and binding multiple objects together, wrapping and sealing as well as to seal packaging. It can be used on auto and bike repair projects. Duct tape has been known to save lives too as it can seal holes in leaky water bottles, repair canoes, create medical slings, tourniquets and splints as well as securing items to prepare a shelter. This is a multi-pack case of black gaffers tape rolls that are 30 yd by 2 inch wide. The multi pack comes with 3 rolls, so that you get bulk value. The Gaffer tape first got its name intended for the gaff microphone. Today, it is used like duct tape within the professional photography, production and filming industries where it is used to secure cable and wire. People also use gaffers tape as tools for book binding, podiums, concerts, motion pictures, television, theatre or theater stage, and backdrops or backgrounds. As mentioned, gaffer tape is one of the most common photography accessories and essentials. Also, known as photographer tape, this black duck -like matte tape is usually 2 inches wide, residue free and waterproof. It is a piece of equipment that it makes sense to buy in bulk! 3 pack - Black Matte Gaffer Tape - Multi-Pack - 2 inch 30 yd per Gaffers roll. Also known as photographer tape, it is wide, strong, waterproof and residue free. Great tape for pro filming, production, photography, and photo development. Tape multi pack can be used for concert and theatre stage floor, cable, wires, podium, motion picture equipment, and box theater accessories. WIDE VARIETY OF USES: Ideal for an array of uses, including general repair, sealing hot and cold air ducts (excellent HVAC tape), duct insulation systems, sealing aluminum, stainless and plastic seams / joints, temporary repair of metal surfaces, copper pipe fixing, etc. 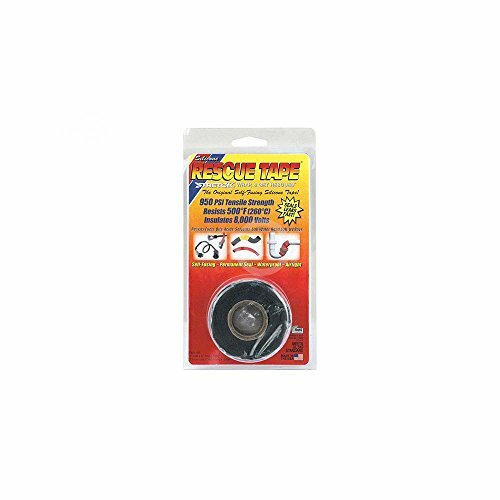 Shower, Garden, Kitchen, Boat -practically any leak can be fixed with Rescue tape. Can be applied on any kind of surface and WE Guarantee it will never become gummy, sticky or unravel itself.Serves as a permanent fix when applied properly. Most people carry Rescue tape in their Emergency bag, car or on a boat for unexpected emergencies. Broken radiator hose or hot pipe is easy to fix with Rescue tape because it can handle temperature up to 500F and pressure up to 950 PSI. 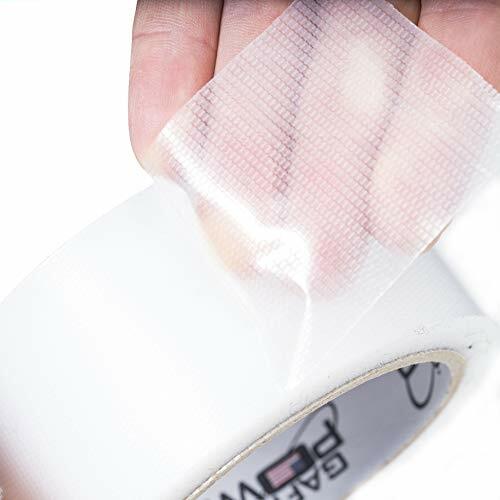 Rescue Tape is extremely durable but when it comes time to remove it, it does not leave any sticky residue like a duck tape.Rescue tape does not stick to anything so all you need for a proper application is to stretch it and overlap it. Excellent insulant. It creates Insulation up to 8000 Volts per layer. You can safely put your Christmas lights out, protect your antennas against UV light and corrosion or simply protect wires against harsh conditions and salt water. MILITARY DAMAGE BATTLE KIT: We are proud to say that Rescue tape is the only Silicon tape that is used by U.S.A military in their Recovery and Battle Damage Assessment & Repair Kit (BDAR KIT). Made in U.S.A.
Grizzly Brand would like to introduce our silver Grizzly Duct Tape mult-pack. Our duct tape is 2x stronger for a superior long lasting hold. 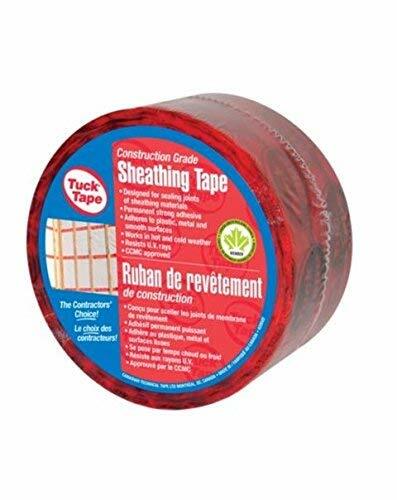 Constructed with 11mil double-thickness adhesive and strong reinforced backing, this duct tape has a tough all-weather shell which is ideal for projects and repairs both indoors and outdoors. 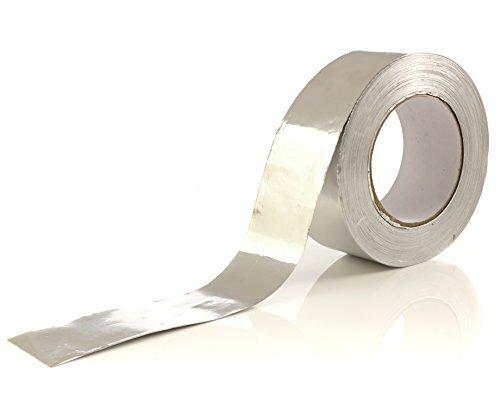 Grizzly brands silver duct tape adheres and sticks to smooth, rough and uneven surfaces, including drywall, plaster, steel, wood, stone, stucco, brick, metal and vinyl. You are receiving 2 rolls of duct tape. Each roll measures at 1.88" wide x 30 yards long with a 3" core diameter. It's easy to use the Grizzly Duct Tape. Just use it like any other type of tape. Tear the silver duct tape by hand or cut to size with a knife or scissors. Carefully apply the tape and smoothing out any bubble pockets or rolls. It really is that simple. Now you can enjoy the strength and durability of Grizzly Duct Tape! Available in a wide variety of strengths and technologies, Duck Tape Brand duct tape is relied upon as a trusted, must-have tool for just about any application. 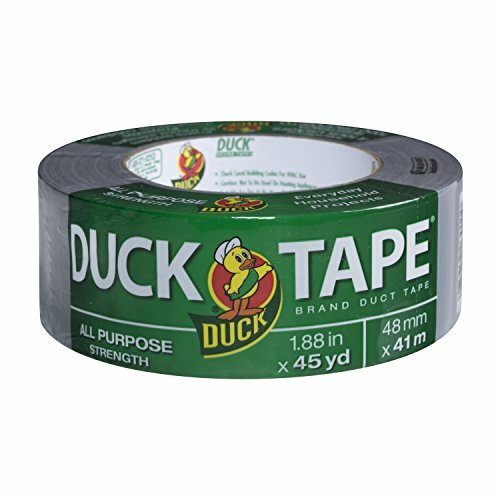 Because of its strength and adhesive properties, you can use All-Purpose Duck Tape for almost any job, including everyday household and auto repairs--anywhere a flexible and weather-proof bond is needed. All-Purpose Duck Tape has a thick, heavy-duty adhesive applied to a waterproof cloth backing for extra durability and to resist delamination in direct sunlight. 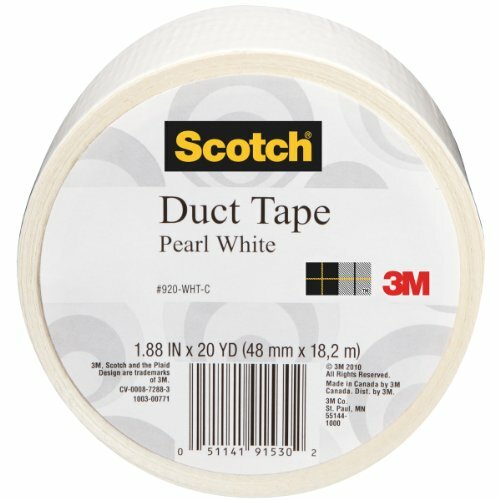 Scotch(r) colored duct tape in white is a multi-purpose duct tape used for discreet repairs, crafts and decorating projects. It's ideal for color-coding and matching as well as temporary repairs. *Service Temperature Range: up to 200F PowerSteel Duct Tape is a must for anyone looking for the best quality on the market What makes GAFFER POWER different than other brands? *Unlimited Value: Our customers stay with us for life. *We stand behind the quality of our products and if you're not 100% satisfied with your purchase, we have a no hassle money back guarantee. Get Your Gaffer Power CLEAR DUCT TAPE Today! GAFFER POWER premium clear tape brings you all the strength & versatility of duct tape with a transparent design that discreetly adheres to restore features & surfaces Like New. 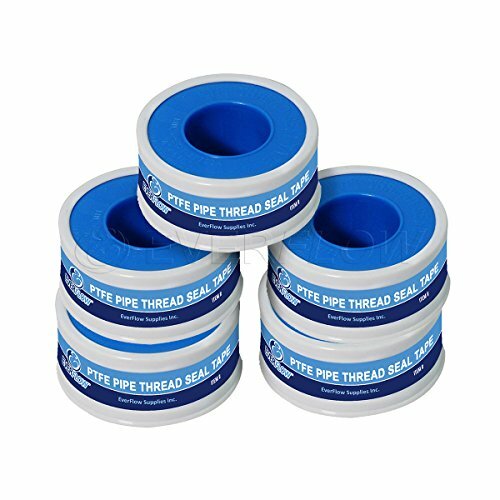 Makes the perfect subtle PVC tape, screen repair tape, seal tape, window tape and much more for repairs at home or on the job. WEATHER RESISTANT INDOOR & OUTDOOR USE: PowerSteel Clear Duct tape is engineered as a see-through yet heavy duty weatherproof tape that expertly withstands rains & storms as well as humidity & sweltering summer days. Our tape firmly sticks to rough & uneven surfaces of all kinds including wood, plastic, glass, vinyl, brick, stucco metal and rubber for a seal that locks & lasts. The ideal greenhouse tape. EASY TO HANDLE QUICK-TEAR TAPE ADHESIVE: This clear adhesive tape provides maximum strength & workability for quick, pain-free repairs and touch ups in a pinch. Tight seal tape has a biaxially-oriented propylene backing with acrylic resin adhesive that tears into easy strips and comes off clean. THE GAFFER POWER GUARANTEE: We know you'll love the endless uses you'll find for our crystal clear duct tape. Issues aren't common when it comes to the best clear duct tape roll on Amazon, but if anything is wrong we stand by our commitment to quality and offer a Guaranteed Replacement or Your Money Back! 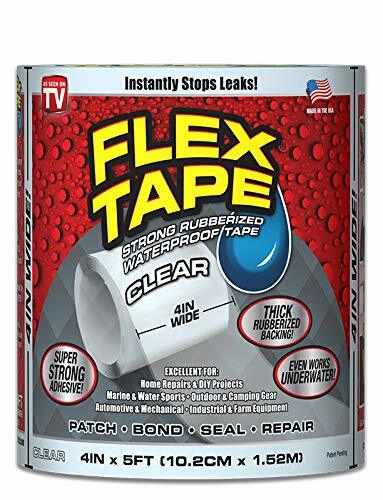 Brand: Gaffer Power | Manufacturer: Webgage Commerce Inc.
Flex Tape is a super strong, rubberized, waterproof tape that can patch, bond, seal and repair virtually everything. Flex Tape grips on tight and bonds instantly. So easy to use for any emergency! And it's so strong, it even works underwater. Flex Tapes bond will increase with time and pressure. USE ON: PVC, acrylic, metal, steel, copper, aluminum, wood, ceramic, porcelain, tile, glass, rubber, fiberglass, stucco, plaster, stone, cement, concrete, dry wall, EPDM roofs, some plastics, fabrics, vinyl and so much more! Comes in Black or White for all your needs! EXCELLENT FOR: Roof leaks, gutters, down spouts, boats, kayaks, personal water crafts, canoes, outdoor equipment, mobile homes, RVs & campers, PVC & plumbing pipes, sprinkler systems, pools and spas, windows, doors, walls, seams, vents, air ducts, HVAC s creates a super strong, waterproof seal, DIY projects and so much more! FLEX TAPE is a super strong, rubberized, waterproof tape that can patch, bond, seal and repair virtually everything! FLEX TAPE is specially formulated with a thick, flexible, rubberized backing that conforms to any shape or object! FLEX TAPE can be applied hot or cold, wet or dry, even underwater! FLEX TAPE instantly seals out water, air and moisture to create a super strong, flexible, watertight barrier! FLEX TAPE is UV resistant, environmentally friendly, VOC-free and has a wide temperature range so it can be used in extreme weather conditions!